Here are my photos of the Epoct closing show called IllumiNations:Reflections of Earth. Being there to see it was an amazing experience. 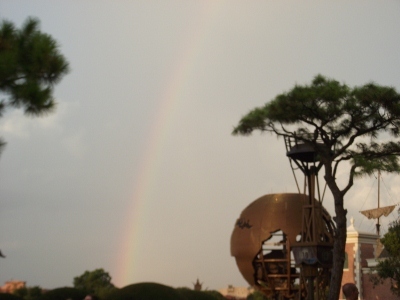 We tried to see it while on our Disney vacation last year but we had no luck. 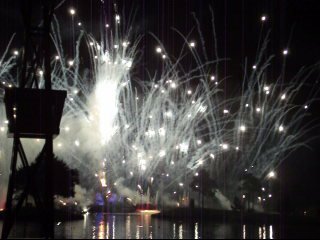 IllumiNations combines lasers, water, fireworks and a killer soundtrack to create one of the most stunning masterpieces at Walt Disney World. My Epcot closing show photo. Hubby, the kids and I arrived plenty early to stake out a claim around the World Showcase Lagoon in Epcot. We bought bottled water, set up our cameras and settled in. Then the thunder rolled and rolled. You can guess what happened next. At the time the Epcot IllumiNations show was supposed to start at the World Showcase Lagoon the weather broke loose at Walt Disney World. Hoping against hope, Hubby stayed behind in case the deluge stopped. I dashed for the open tent we had left in the campground. It was not a pretty sight nor was it a full run for IllumiNations: Reflections of Earth. It was an all around mess. The rain at Walt Disney World flooded our tent and stole the show. On our Disney vacation this year we had much better luck. The Epcot IllumiNations: Reflections of Earth show turned out to be worth the wait. Hubby and I enjoyed it so much that we sat through it twice and would cheerfully do so again.